Growing your business with Facebook means unique things to different types of businesses and people. Besides your own unique needs, you need to understand more about your readers’ unique needs, wants, likes, desires, passions, oh, and point of view. Your job is to know what they want from you that you want to offer. Your Facebook posts are your breadcrumbs leading your ideal readers down that trail we call your funnel. Putting content out for your readers that’s custom-made to attract their desires and needs brings you success and is your work! Now use an enticing headline for more post attraction power! Do take a look at Co-Schedule Headline Analyzer to give you some great insights in how to go about making your headlines get more attention. And be sure to watch the video in this post (above) to get more ideas of how to best use this headline analyzer – plus I do share another headline analyzer that can be helpful. Using a powerful headline to attract is always the goal! Remember, it doesn’t matter how good your copy is if they don’t read it. – It’s you breaking through and gaining their awareness with your headline that may help more Facebook engagement. Pointed: The best Facebook headlines are to the point, meaningful, and easily understood. >> Facebook’s recommendation is that headlines are 25-40 characters long to maximize engagement. Of course, always ask yourself – if you were seeing this post in your newsfeed, would you be attracted to it? I don’t like saying it, but I like instant gratification and I’m aware that most people on Facebook feel the same. Right? The purpose of solving problems for your audience. What could you share to drive engagement? This gives you a few ideas of what to post to get some Facebook engagement. All of these pieces are part of your puzzle to reaching goals of what you really want from Face. I had no idea that Co-Schedule had such a thing as Headline Analyzer. That’s a pretty neat concept. I used to use Co-Scheduler but stopped because it wasn’t exactly what I wanted. I miss the old days of Facebook when you did not have to buy ads to get your stuff seen. I still post on my FB page but not nearly as often as in the past. Now I am all about Pinterest and StumbleUpon. Great tips! Facebook engagement can be hard to figure out, but once you get it, you are golden! You are so right about that, Echo!! It works when you work it and then ‘get’ the routine in your head! People just want to connect. They need it to be real! Great info! I am struggling with FB. I remember years ago when it all was so much easier. Thanks for this post, it definitely gave me some pointers at least why I am getting next to no views from Facebook. I have high hopes for you – and hope to hear what you’ve done that may have helped! I always struggled with all this new marketing stuff for facebook! Trying to get my facebook engagement up is hard! Thanks so much for the tips! Can’t wait to see how they worked for me! Actually, I am sad because I took on more than I could handle and the whole thing kind of fell apart. I own 6 websites and I foolishly thought I could work on them all at the same time. I really need to combine two of them into one (Both food) and then consider if I should keep the rest. I have some money invested in the others but they are such a time drain and while two of them are personal and fun, the other two I just put together because I wanted to make a little money. (didn’t happen yet) I think that for an income producing site that helps others I need to focus only on http://YourWholeFoodsChef.com and just let the others sit there for now. Lots of great tips here. It’s so hard to do well on Facebook now with all the algorithm changes. Yes – and once you have your winning system to reach and engage – Wow! It can be challenging to keep up with all that is necessary to keep our facebook fan engaged. A tool like co-schedules headline analyzer is very helpful. 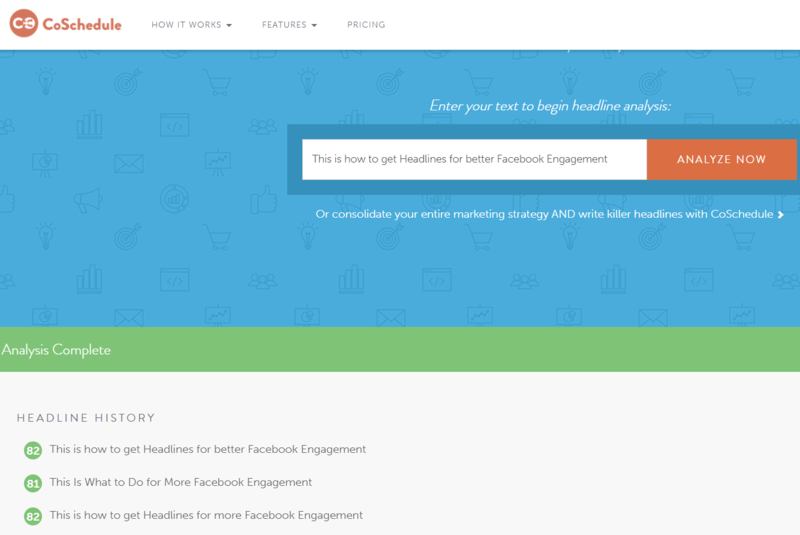 Co-schedule Headline Analyzer is one of my fave tools. Still trying to get more engagement on FB and your P3 makes a lot of sense: Personalized, positive and pointed pretty much sums it up. Thank you for this! I’m always looking to boost my Facebook engagement and I never know what I’m doing. I’m always interested in hearing what works for other bloggers on Facebook. I agree with breadcrumbs, you need to lead them to the main course! Yes – Co-schedule can be used for our blog posts! I have a lot of followers on my FB page, but not a ton of engagement, which is what you really want. Plus if your followers don’t engage with your content, they stop seeing your content in their feed…ugh!!! So glad to read your thoughts, Kim – and yep you got it right! Thanks for the tips. It has made me think more about how I write headlines on Facebook. I’ve never heard of Co Scheduler. I’ll have to go check them out pronto since I need help with engagement. Hi Donna, Great advice! The Facebook algorithm makes it tough, but I keep forging ahead and will follow your advice. I refuse to pay to boost my posts (unless it is worked into a sponsor’s fee, of course) and have found that my shared posts do very well. I enjoy Facebook for personal use. For business Facebook is one of the lowest on my list of traffic generators. Facebook has become all about money, which is why they keep changing their algorythms. It’s definitely a must to find out what will motivate your audience. It takes a lot of trial and error moments, that’s for sure! Yep – Kita – it’s testing and trying until you see what works – and then put that into your own system. Facebook is a hard nut to crack. This is some good information. Learning to engage with your audience is key to growing a following. Thanks for the tips! I’ll have to start using some of these. This is a great visual for how and why we do the things we do when we work in social media. Facebook is a very goo source for pulling viewers to your business site. You have provided some really valuable tips to improve the engagement. I’ve been working a lot of my Facebook page lately. It’s so hard to grow social media! I had no idea that Co Schedule has that, I’ll have to check that out! Facebook is a constant bit of work (and fun) – so co-schedule can add to the fun part! I use co-schedule title analyzer and it is a huge help. I feel good knowing I at lease have one part down. FB making everything so complicated. that’s what every blogger and small business owner wants, it’s to market/advertise in the best way possible to create leads and engagements… these tips are of value and will help, thank you! Facebook advertising has definitely been an enigma/conundrum for us! This post is so helpful and thank you for the ‘heads up’ on the co-scheduler! I look forward to trying that! I love CoSchedule Headline Analyzer, a great tool that always helps me out. Though I have never gotten over 90! I love all your tips and ideas. And so glad you enjoyed my tips and idea!